Choose a BA in Music (with a Year Abroad) at the University of Southampton to develop your musical skills and build a network of international contacts. On this uniquely diverse and flexible programme you will study the basics through foundations in analysis, counterpoint and harmony. You will explore music history, listen to music from around the world and learn to write your own music. You can take vocal and instrumental lessons with a specialist teacher, putting the skills learned on this BA degree to use when you take part in high-profile performance projects. Exchange programmes with prestigious partner institutions in a number of countries give you the opportunity to live and study abroad in your third year. Graduates from this bachelors degree go on to pursue careers in the music industry, in music education, in music therapy and in many other fields where creative ability, initiative and team working experience are required. Language skills will set you up for life. In your first year a core programme of musical studies provides a broad grounding in the fundamental elements of music performance, composition and academic musical study. In your second and fourth years a free choice is available from a wide selection of courses in range of subjects. You may also choose to take up to 25% of your programme in subjects from other disciplines throughout your degree programme. Your third year will be spent abroad at one of our partner institutions, the full list of which can be found on the Exchange partners page. History and Criticism: introduces historical, analytical and repertory studies, ethnomusicology and sociological topics, from the Middle Ages to the present. Performance: supports instrumental and vocal performance (solo or ensemble) in classical, jazz and pop styles, with 20 hours of fully funded individual tuition per year for solo performers, plus fortnightly master classes, professional workshops and group coaching. Composition: includes extensive project work and advanced studio techniques, leading to the submission of a collection of original compositions, either classical or commercial. For more information visit the Undergraduate music page. To read about our former students and their current careers, visit the Our students page. *Equivalence to grade 8 is ascertained via audition. This can be done in person or by sending a video. A typical contextual offer is BBB from three A levels including Grade B in Music, and Grade 8 or demonstrated equivalent standard* or an equivalent standard in other qualifications approved by the University. During your third year, you will be at one of our partner institutions. You can find out more about them on the Exchange partners page. Music finalists are required to take one double module from the following list: MUSI 3008 Performance Recital, MUSI 3003 Commercial Composition, MUSI 3017 Composition Portfolio, MUSI 3021 Research Project. Equipment Computer Discs or USB drives: Students are expected to provide their own portable data storage device. Software Licenses: All software is provided Hardware: It is advisable that students provide their own laptop or personal computer, although shared facilities are available across the University campus. Placements Placements (including Study Abroad Programmes): Students on placement programmes can expect to cover costs for health and travel insurance, accommodation and living expenses; travel costs; visa costs. This will vary depending on which country you are travelling to. Specific details on what additional costs there will be are detailed in the individual module profiles which can be found under the modules tab of the programmes details of your programme. Other Vocal and Instrumental Lessons: Specialist vocal and instrumental tuition for single and joint honors Music students taking performance modules is generally provided free at the point of delivery. When lessons happen away from Highfield Campus students are expected to cover the cost of travel to and from their lessons. Students are expected to cover the cost of travel to and from off-campus rehearsal, performance and music examination venues. Most of those we use are within walking distance of Highfield Campus. Students taking instrumental lessons are expected to own and maintain their own instruments, maintenance including the cost of repairs and of replacement parts (new strings, drumheads etc.). Students are strongly advised to arrange insurance for their instruments, covering all the usual risks including theft from places of residence and from university storerooms. Storage space for instruments is available in Music Department storerooms. Dozens of students have access to them: it is not possible to guarantee security. The university will accept no responsibility for loss or damage to instruments left in storerooms. Students taking performance modules will be given keys to practice rooms and storerooms. Keys must be returned on or before graduation day. Students will be charged £10.00 per replacement key in the event of loss. Jazz and pop students must buy and use their own ear protectors if asked to do so by a teacher. Hartley Library holds a very large collection of sheet music which students can borrow free of charge. Students who want or are advised by teachers to buy their own music, perhaps in order to mark it up, will be expected to cover the cost themselves. The Music Department has a large collection of keyboard instruments to which keyboard students are allowed free access. It owns a number of other instruments (piccolo trumpet, bass sax, basset horn etc.) which students can borrow on their teacher's recommendation. We do not charge for the use of them but do recommend that students make private insurance arrangements when taking them off campus, especially on tour. If not returned intact they must be replaced like for like at the student's expense or at their insurer's. Students may wish to hire professional accompanists to play with them in performance exams. Accompanists charge varying levels of fee (rarely more than £60.00 per exam accompaniment, including prior rehearsal) and students are expected to pay the fees themselves. Turner Sims -- the university concert hall -- makes 10 tickets for each of its own-promoted concerts available free of charge to Music on a first come, first served basis. (There are very rare exceptions: gala concerts intended to raise funds for Turner Sims for instance.) Monday and Friday lunchtime concerts in Turner Sims organised by the Music Department are free of charge both to Music students and to the wider public. External promoters hiring Turner Sims can charge what they like for admission to concerts. Student-run performing arts societies such as the University of Southampton Symphony Orchestra, JazzManix and Showstoppers (there are many others which Music students might like to join) are free to set their own membership subscriptions. The Music Department does not contribute directly towards the cost of running these societies. ACADEMIC MODULES Very few Music lecturers insist that students purchase specific set texts. Copies of set texts are made available in Hartley Library, if necessary in the reference-only "course collection" or on short-term loan. Students may wish to own copies of recommended books but are free to choose which to buy and which to borrow. Some lecturers prepare course handbooks for the modules they are teaching. These are generally made available free of charge to students taking the modules. For unusually bulky handbooks there may be a charge to pay -- never more than £10.00 per copy. Music software packages are available for licensed use at designated university computer workstations free of charge to Music students. Students who wish to install compatible software on their own computers will have to cover the cost themselves. 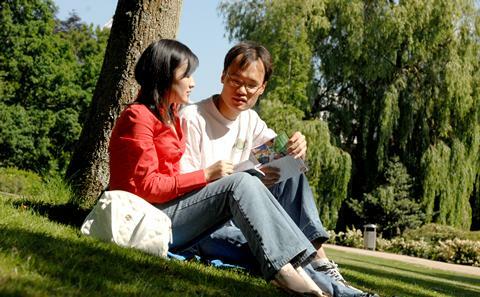 Students using the university's Follow Me print service will be charged per page printed out, at rates listed here: https://www.southampton.ac.uk/isolutions/students/printing-for-students.page Field trips are infrequent and almost always optional. When occasionally they do happen students involved may be expected to cover travel costs and to pay for admission to the venue(s) visited. Staff organizing trips make every effort to keep costs to a minimum, negotiating group and student discounts whenever possible. No one trip is likely to cost more than £20 total. Employability is embedded into our modules from the first year onwards, right from the first lecture. We offer a number of optional employability modules. This degree prepares you for a variety of careers both within and outside music. Our alumni have gone on to work in broadcasting, performance, education, music therapy, composition, commercial music and information technology, among other areas. Katherine Hattersley graduated in 2010. “A week after graduating, I got my job as a Fundraising and Membership Officer for Bournemouth Symphony Orchestra,” she said. “My degree and community work at Southampton definitely helped”.